In general, I like bánh mì sandwiches – they are tasty, they have a little kick (actually a lot of kick, so I am careful to take out any peppers and daikon I find in them) and they are very cheap. However, they also usually have too much bread, too many vegetables and too little meat. 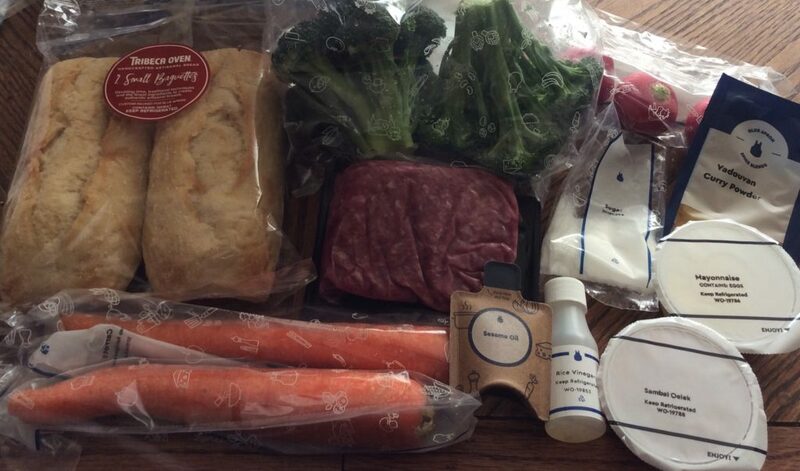 So I was looking forward to making this Blue Apron kit for bánh mì-style beef burgers on my own. Alas, I didn’t actually look at the recipe so I didn’t realize the only vegetables they were including were carrots and radishes. Not too big of a deal, but it sort of detracts from the whole “bánh mì” experience. The protein was ground beef mixed with curry and seasoned with salt and pepper. It was surprisingly tasty. 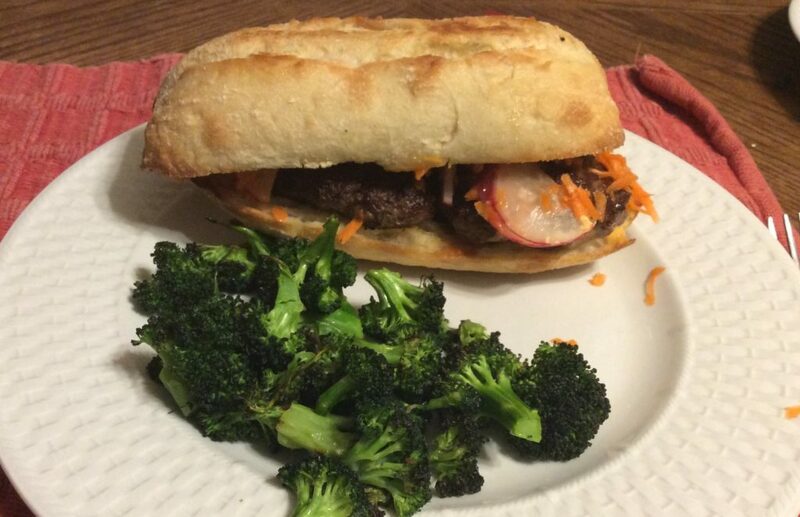 I tend to add curry powder to pretty much anything, but I hadn’t really tried it in a burger. I will again. But what really made the burger – for me – was the bread. The demi baguette was toasted with olive oil and some salt and it just went wonderfully with the meat. I wasn’t impressed with the carrots, so I mostly pushed them up. The meal kit came with mayo and sambal oelek that you are supposed to mix together and then spread on the bread. I added too much sambla oelek, however, and it was too spicy for me so I used plain mayo on my sandwich – it was great. I used the spicy mayo on my husband’s sandwich, and while he didn’t find it spicy, he also didn’t find it particularly tasty. If you make it, skip the sambal. In any case, I really liked my sandwich and my husband liked his less. He liked the broccoli, however, which was mixed with sesame oil and roasted. My daughter didn’t – so it’s hit and miss. I got all the ingredients needed for the recipe, and they were all pretty fresh – though the carrots were starting to get wobbly. Still, I got my box on Monday and cooked this on Friday, so I really can’t complain. My favorite part of the meal was the bread, which is made by Tribeca Oven in New Jersey. The demi-baguette was wider than most, the crust was softer and the center denser. I’m going to have to try to find something similar around here. I appreciated that the kit included sugar. While I keep that at home, I know a lot of people who don’t. I paid $12.50, or $6.25 per serving, for this kit with a sign-in promo. It was worth this but not the $20 regular price, as you can get a real bánh mì for less.